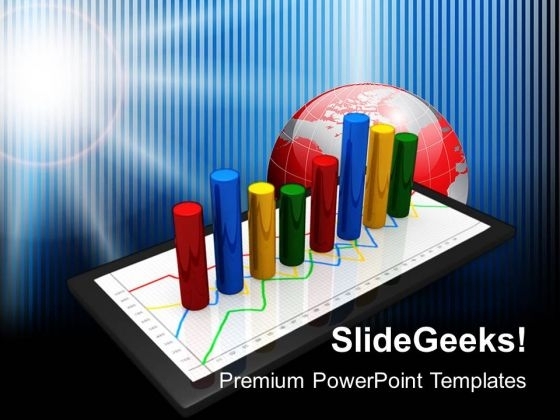 We present our Tablet With Bar Graph Global Business PowerPoint Templates And PowerPoint Themes 1112.Use our Business PowerPoint Templates because, You have it all down to a nicety, slice by slice, layer by layer. Use our Cylinders PowerPoint Templates because, Explain thecontribution of each of the elements and how they provide impetus to the next phase. Use our Technology PowerPoint Templates because, They enhance the essence of your viable ideas. Use our Marketing PowerPoint Templates because, Original thinking is the need of the hour. Use our Globe PowerPoint Templates because,But you have an idea of which you are sure.Use these PowerPoint slides for presentations relating to "Tablet pc with graph, cylinders, business, technology, marketing, globe" . The prominent colors used in the PowerPoint template are Red, Blue navy, Yellow Innovate and succeed with our Tablet With Bar Graph Global Business PowerPoint Templates And PowerPoint Themes 1112. Download without worries with our money back guaranteee. Conquer the boardroom with our Tablet With Bar Graph Global Business PowerPoint Templates And PowerPoint Themes 1112. They afford you a commanding presence.